Liza is originally from San Antonio, TX but has been living in different parts of New Orleans for the last 6 years. Liza came to New Orleans right after graduating high school and joining City Year New Orleans. Her year of service was spent in a first grade classroom where she helped with classroom studies and management, but more importantly, created lasting relationships with her students and lead teacher. Her passion for education and social equality led her to receive a degree in Sociology from Loyola University New Orleans. Since graduating, Liza has been working at the Louisiana SPCA as an adoption counselor. Though she loves working with the animals, Liza has decided to get back to her passion of teaching and working with youth in New Orleans. Her hobbies outside of her work include hanging out with her three animals, reading, and cooking! Ana is on maternity leave and will return in August 2019. Anastasia “Ana” Ana has 6 years of experience in an early childhood education setting. She joined the Abeona House teaching staff in 2017. She was born and raised in southeast Louisiana. Her passion for teaching began at an early age, always eager to lend a helping hand with her younger siblings. Her favorite thing about teaching is witnessing each child develop, grow, and blossom into their own unique personalities. When she is not at Abeona House, she is delighting in being a mother to her son Greyson (Rabbit Burrow). JaNae’ N. Chambers is a mother of three, a community birth doula, and a breast feeding advocate. She first developed a passion for early childhood learning in 2007 when she began working at her family-owned-and-operated child care center. Since then, she has worked tirelessly to develop a holistic approach to early childhood development and is passionate about creating and implementing strategies that incorporate a total care approach. She continues to work to ensure that families have better birth outcomes and access to whatever resources necessary, to make their children successful. Krystal’s afternoons of caring for the toddlers in her foster mom’s daycare, mixed her love of play, reading, and service; and inspired her quest for understanding the process of learning. She continued to work in toddler care and youth development as an Au Pair, tutor, camp counselor, and middle school academic interventionist and librarian. After moving to New Orleans in 2014, Krystal spent some time living the start-up life, but like the undertow of the tide, she was being pulled back to learning development. She’s currently in pursuit of a graduate degree in Applied Educational Psychology. Her goal is to to develop into an expert philosopher of learning, language, and motivation-development. Her superpower is alliterative aliases. Hers is “Curly Karaoke Kook”. Paris is a wife and mother. She has 3 boys, Malachi 10, Pernell 7 and Christian 5. Paris grew up in Kansas and her husband is from New Orleans. She is passionate when it comes to working with others and has been a caregiver for the past 10 years. She loves helping others and seeing them smile and progress in life. Paris is excited to be a part of the Abeona team and to watch the the young ones grow. In her free time, Paris enjoys spending time with her kids outdoors. Lori was born and raised in Port au Prince, Haiti. She has spent most of her life working with children in diverse ways – tutoring, babysitting, summer camp, basketball and soccer coaching, and has 8 years teaching experience. She holds a BA in Education, an ESL Certification, a Montessori Education Certificate, and a Masters Degree in Psychology with an emphasis in Expressive Arts Therapy. 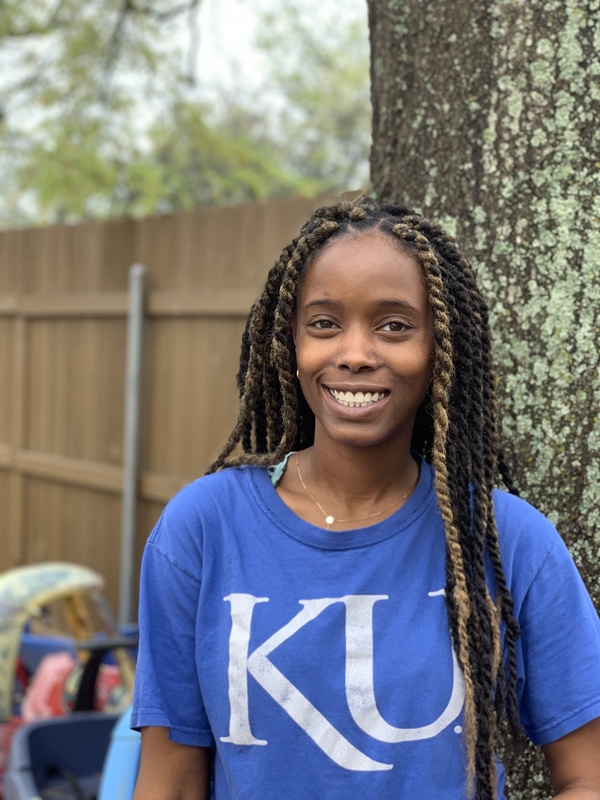 She has recently moved to New Orleans from Jacmel, Haiti and runs an organization called Haitianola, which works to amplify the connections between Haiti and New Orleans. She loves creating art, spending the day at the beach and red popsicles. All the way from Empire, Louisiana, (A.K.A. down the road), Angie is the only one in her family that was born in the U.S. Her mother (Marija), father (Zoran), and sister (Lorita) came here from Croatia in the early eighties and moved to the small fishing community. Her dad worked as an oyster fisherman and her mom stayed home and took care of the family. Angie attended and graduated from Buras High School. Afterwards she attended Nunez Community College where she received her Associates Degree in Care and Development of Young Children. After working at a traditional school for six years, she decided it was time for a change and came to Abeona House in 2014. “Children have always been my passion. Spending time with children makes me happy, but nothing makes me happier than being a part of their lives, and most importantly, their learning. I believe that children learn through play and have the power to brighten up your day.” Angie enjoys spending her free time with her family, Elmer and Binta, and also her fur babies Mimi, Ali, and Lil Boy. Zoe was born in raised in Louisiana. Monroe to be exact (a yankee). She comes from a family of teachers and spent some time working on a Secondary Education degree with a concentration in English at Louisiana Tech in Ruston, Louisiana before transferring to the University of New Orleans two years ago where she is now working on a BA in English. She has always loved little ones, and after her first interview at Abeona she realized her calling was in early childhood education. She loves playing guitar for the kids and putting on puppet shows for them during snack. She’s very happy to be a part of the Abeona family! After spending their first 12 years in various rural parts of the northeast, Foster moved to central Alabama, which they now call home. They graduated from Tulane University in the summer of 2018 with a B.S. in Public Health and a second major in Digital Media Production. Foster’s approach to childcare is grounded in their love of public health, their work as a visual artist, and their background as a community organizer in the Deep South working on issues of queer, racial and economic justice. As the Floater teacher (and #1 Beehive fan), Foster loves the opportunity to engage with all Abeona students as they flourish and grow during these formative years. Foster is an avid sci-fi reader and pastry enthusiast! Outside of organizing and teaching they can be found taking 8 million photos of their tailless black cat, Breq. Cypress was born and raised in Connecticut. They went to college at Central Connecticut State University where they earned a BFA in Theater. They got their start in working with youth right after college when they moved to Olympia, WA and worked with the Olympia Family Theater. After that they worked at a summer camp in California before moving to New York City. In New York, Cypress joined an experimental theater company and also began creating original performance work. They moved to New Orleans to be closer to their mom (who lives here) and to join the exciting artistic community that this city holds. They still creates performance work and is excited to be working with youth again. Carmen Lasagna was born in Providence, Rhode Island and grew up mostly in Southern Maine. She has been fascinated with caring for young children from an early age and started babysitting when she was twelve. Later, while in high school, this interest led to working in the children’s section of her town’s public library and holding numerous volunteer positions helping children from Maine’s Somali refugee community practice English. After attending college at Bard in New York, where she pursued E.L.L. (English language learners) teaching, Carmen moved to her favorite city she’s ever been to, New Orleans, in 2012. She began nannying full-time immediately upon moving to the south. Through nannying, Carmen got connected to the magical and inspiring community that is Abeona House, where she is now the part-time assistant in the Fish Cove. “I am so moved by the level of respect and caring that is ever-present in every interaction here at Abeona. I have always been attracted to approaches in childcare that focus on patience, love, and high regard for the importance of children’s feelings and perspectives. And this is exactly the type of environment I have been lucky enough to find myself in here!” Since living in New Orleans, Carmen has also dedicated much time to helping provide free childcare for the weekly meetings of social justice organizations in town through the Crescent City Childcare Collective, both as a volunteer and a core organizer of the collective. She is passionate about seeing that children without privilege receive the quality care that all kids deserve and that loving support is available for parents in need. Carmen loves her neighborhood in the 7th ward where she lives with her best friend and a very special cat named Witchy. She loves to ride her bike and find new nature spots to explore! Shannon grew up in upstate New York. Being the oldest child and oldest cousin she naturally became the babysitter for her whole family, and eventually the neighborhood. Nannying and babysitting has always been in her life even throughout her moving around. Residing for a few years in Tallahassee, she graduated from Florida State University with a BA in Recreation, Leisure and Service Administration. She developed a side passion for Events and Music Event Production. Living in New Orleans for now 7 years, she worked, and still works, at some festivals around the city; for example curating and running the Kids Stage at the Bayou Boogaloo. Although she still loves music and events, she decided that her passion was with assisting day-to-day with the social, physical and cognitive development of children. This made her the happiest and gave her a true sense of real worth in this crazy “thing” we call life. This is her year working with Abeona House, as the Lead Teacher in the Garden Room. She is thrilled and so excited to be a part of this loving team, and looking forward to helping spread love, light and positive growth to the little people of the big loving home, Abeona House!! Laura Kinkton is from Jacksonville, Florida and recently relocated back to the New Orleans area. Laura has three children aged 27, 24 and 7 and three grand-children aged four, three, and one. Laura has been in childcare for over 28 years with experience as both an administrator and teacher but knew she was ready return to her true passion of educating young children. She currently holds an Associate of Arts degree and will be finishing up her bachelors with a major in Supervision and Management and a minor in Early Childhood Education. She also holds a CDA as well as a Florida directors credential. Laura enjoys reading and is always looking for new and exciting ways to inspire children to explore the world through literature. “You can take a child anywhere they want to go with a good book! Inspiring a love of literature opens up the world to a young mind.” Her goal at Abeona House is to have a classroom that is filled with messy projects, interesting conversation and joyful learning. Born in San Francisco, California, Emily moved with her family to the East Coast and grew up in Connecticut. She graduated from the University of Vermont with a bachelor’s degree in English and Television/Film Studies, but has been working in the education field for the past 7 years. She has worked extensively in Early Education classrooms, and absolutely loves working with children. She has always had a passion for teaching and believes in the importance of creativity, empathy, and kindness within a classroom. She believes that the first five years of a child’s life are some of the most important, and is constantly amazed by the incredible and imaginative ways that children see the world. She is thinking of eventually going back to school to obtain her degree in Elementary Education or Early Childhood Education. Emily has just recently moved to the New Orleans area and is excited to make the city her new home.